7.3.1912: Launched by Cochrane & Sons Ltd, Selby (Yd.No.527) for Samuel Turrell, Lowestoft as PLOUGHBOY. 22.5.1912: Registered at Lowestoft (LT1177). 6.6.1912: Completed (Samuel Turrell managing owner) valued at £3,000. 9.1915: Requisitioned for war service as an A/S net drifter (1-3pdr HA) (Ad.No.1909). Based Taranto. 7.3.1919: Sold to Ploughing Co Ltd, Lowestoft (Samuel Turrell, manager). Post 12.3.1919: Returned to owner at Lowestoft (S. Turrell, c/o Hobson & Co, Lowestoft). 1930s: Seasonal fishing from Fleetwood (Alex Keay, managing agent). 25.11.1933: In North Sea, disabled with broken rudder post. Steam drifter OCEAN LUX (YH84) connected and delivered Gt. Yarmouth. 31.5.1937: Sold to Vigilant Fishing Co Ltd, Lowestoft (George F. Spashett, manager). 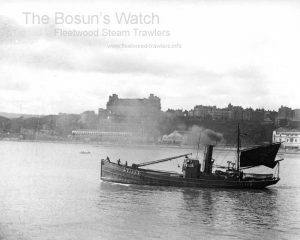 17.7.1937: At Lerwick in collision with steam drifter BOY PHILLIP (LT137). 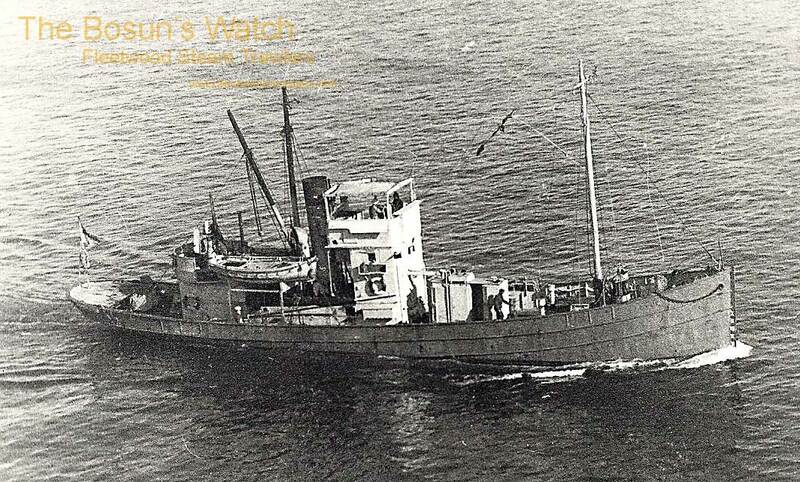 13.11.1939: Requisitioned for war service on examining service/minesweeping drifter (Hire rate £27.0.0d/month). 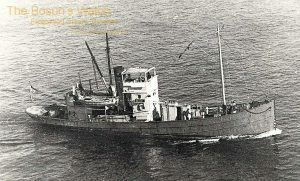 1.3.1941: Off Malta. Severely damaged by explosion of three mines in close proximity. One rating MPK*, nine injured. Beached. 31.10.1941: Compulsorily acquired by M.O.W.T. By 1.1942: Salved, repaired and returned to service (Ty/Lieut. J. Findlay RNR). 7.1946: Sold for breaking up. 25/10/2010: Page published. 8 updates since then. 13/10/2018: Removed FMHT watermarks from images. This entry was posted in Drifter/Trawler, Seasonal Visitors, Steam Trawlers, Steamers (Picture) and tagged Cochrane & Sons Ltd Selby, Drifter/Trawler, No Fleetwood owners, Seasonal Visitors on October 25, 2010 by Fred Smith.